We already discussed a number of reasons why the relationship between Superman and Wonder Woman can't work in the long term over the weekend, but with the young couple having their first kiss this week, it seemed like it was only fair to give them half a chance to get out the gate. What do they have in common? What makes the couple "work" in a way that might allow them to get some mileage? Well, first of all, it might shock some of our readers to learn that DC's editorial staff has been accused in recent times of having something of a heavy hand. It's unbelievable, we know, but people will say anything to get attention. In any event, if there's any truth to that at all, then something like a relationship between two of their most popular and marketable characters is the kind of thing that the might lay the law down on for a while. Imagine how many t-shirts they can sell at Hot Topic and Wal-Mart if they get a couple of really nice shots of the couple holding hands! To that point, I remember my first day as an intern at Wizard: The Comics Magazine way back in 1999 or 2000. I was told by someone there that while a writer could kill off a dozen DC heroes before lunchtime as long as they weren't considered "important" characters, you had to double-check with Warner Brothers corporate before you changed the color of Clark Kent's tie. Also, as we pointed out in our review of the issue, it's not as though the pair have nothing in common. 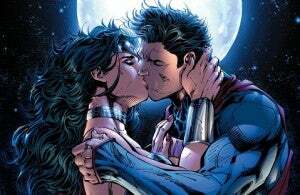 While the common feelings of alienation might wear off over time, the rebooted versions of these heroes are younger and more hormonal than the married, middle-aged versions who rebuffed one another's advances during the "Eternal Beloved" storyline in Action Comics. In spite of Justice League #12 feeling like everything was pointed toward accomplishing plot goals rather than telling a story, Wonder Woman and Superman's moment felt honest and believable. To imagine that two attractive people in their 20's who feel like they might be the only ones in the world who can understand one another, might then fall into each other's arms is not that hard to wrap your head around. On top of all that, there's the fact that some of DC's top brass have been giving the mainstream press interviews where they basically downplay the importance of Lois Lane to the Superman mythology of the New 52. While a comment that Lois and Clark are "unlikely" to happen in the New 52 has since been walked back, with representatives for DC telling Comic Book Resources that nobody ever used those words and it was the reporter's own, erroneous interpretation of the conversation, that doesn't change the fact that the conversation that brought him to that interpretation involved a lot of discussion that Lois and Clark "aren't inevitable."